This went on for a while, talking about being at a mates place on a Friday night with beers and pizza while watching the footy or on a warm summer’s night having a cold cider watching the Australian Open. There are some things in life that come together so perfectly. Like fish and chips, a cigar and tumbler of whisky or a warm summer’s day and the beach. It is like the universe’s own form of poetry. Here at ManSpace, we like to talk about good food, good drink and sport. And when you’re enjoying all three at once, it’s hard to think of anything better. It soon became clear that we needed to make a ‘ManSpace guide to food, booze and sport’. Whether you are at your mate’s place, the pub or at the game, let this table provide some guidance when picking your beverage and munchies of choice. 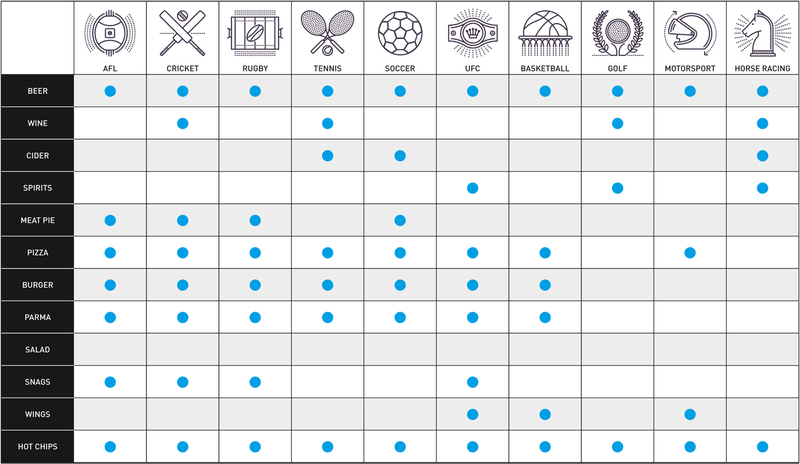 As you can see, beer goes with just about all sports, as for salad… not so much. So here’s to the men who chase the pig skin around a field, the men who charge head-first towards each other in the name of state pride and the men who slash a piece of willow at a 150km/h bouncing ball. Here’s to sport. I will certainly drink to that.